Personalization and user experience are key challenges for effectively using current consumer electronics. The VU University Amsterdam demonstrated in two projects the use of Semantic Web technology for personalization: CHIP - combining the experience in a physical museum with mobile devices and the Web, and iFanzy - a personalized selection of the digital TV content in a cross-media environment. With the miniaturizing of the computer and its massive deployment in end-user electronics the 'disappearing computer' becomes an inseparable part of the everyday life. The ICT landscape is developing into a highly-interactive distributed environment where people more than ever become early adopters of technology. This rapid progressing of the 'technology embraced by public' creates a risk of information overload if the content is not adapted to the preferences and current user context. The experiences become more personal and engaging across multiple media. However, the integration of the different user profiles is limited, lacking transparency in the use of personal data between applications. For example, usage data collected by Amazon.com is only valid within the Amazon domain; it cannot be used for other information services, nor can Amazon cater for different 'modes' of a user. Such personalization is still local and the user experiences are still 'digital islands'  within the boundaries of single applications, not interconnected to allow users capitalizing on the full potential of distributed multi-device environments. Methods and techniques that embrace the complexity of the distributed digital space of devices, information and users are needed to collect the existing fragments of personalization components and provide the essential glue to support personalization across the boundaries of particular applications and devices. CHIP (Figure 1), an interactive application of semantic Web technology, illustrates how the physical museum, the mobile devices and the Web can be combined in order to maximize the museum visitors' experience anytime and anywhere. Users' interests and art preferences expressed as semantic metadata of cultural heritage, offer a personalized way to explore digital and physical museum collections through multiple devices (eg PC, mobile phone, PDA) and sensor technology, eg RFID. The CHIP (Cultural Heritage Information Personalization) project is guided by a use case provided by the Rijksmuseum Amsterdam, and is funded by the NWO CATCH program. In iFanzy personalized cross-media TV guide background knowledge is used for personalized access to TV content in a cross-media environment with TV settop box, PC and mobile. The continuous observation of the user in all spaces (eg online and with various sensors at home) allows for a context-sensitive adaptation. This work has been realized as a collaborative effort between Stoneroos Interactive Television, Eindhoven University of Technology and VU University Amsterdam with a Eureka ITEA funding. 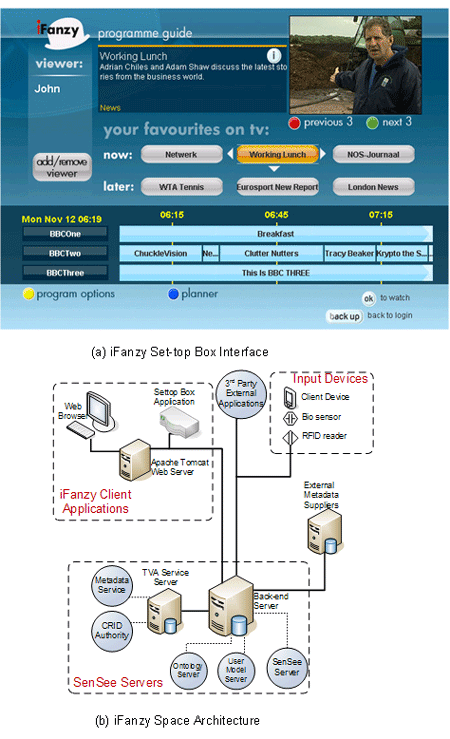 Figure 2: iFanzy Web interface. space-integration principles, ie user experience optimization strategies. Complementarity ('use the right space'): Use the applications and devices in the three spaces in a complementary way, so that the overall user's experience is improved. For example, the iFanzy Web application is handy for searching, browsing and text-typing tasks. Where a mobile device is used for user identification and one-click-away actions. Minimization ('do not bother the user'): Minimize the explicit user input, while maximizing the background collection of user and context data and its integration from different applications. This allows in CHIP to start instantly the personalization process, and prevent a 'cold start' in the TV recommendation in iFanzy. Context-awareness ('know where you are serving'): Consider the specific context for presenting information to the user in order to achieve good confluence of the content and the context. Support user awareness about the current context both while navigating in the museum and interacting with the iFanzy recommender. Vocabulary bridging ('talk the user's language'): Provide ways of bridging the gap of terminology between expert-created applications and the end-user ways of naming items, searching and browsing. The information integration, modeling and presentation have been realized with semantic Web technology. Museum and TV metadata have been provided in RDF/OWL format, as well as relevant vocabularies, eg TV-Anytime, XMLTV Genres, IMDB Genres and Locations, WordNet, IconClass, Getty AAT, TGN and ULAN. The RDF/OWL graphs resulting from the aligning and enriching of these vocabularies and metadata allowed for building a combined (virtual and physical) user model and further apply it (1) for (semi-)automatic generation of virtual and physical museum tours, and (2) semantic recommendations of TV programs. 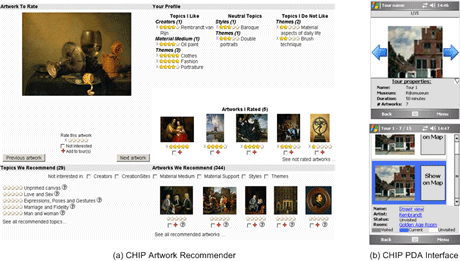 In CHIP AAT Style metadata had been added and further mapped to the artists in the Rijksmuseum collection, to allow for serendipitous recommendations based on relationships between artist and artworks in the same style or relationships between artists, eg collaborator and student_of. The use of RFID technologies allows for an instant interaction with artworks in the museum and for its logging for the user profile.